Today was a travel day, so not very much happened. We got up and had breakfast in the hotel, then a framing discussion on the legalization of marijuana. I’m not quite sure how I feel about this, but I lean towards legalization. I think that marijuana should be legal, but with regulations. A couple of arguments made included marijuana being harmful to developing brains and the possibility of addiction. However, these concerns also apply to alcohol or tobacco. Marijuana, to me, seems to be about the same grade as these examples, which are legal. 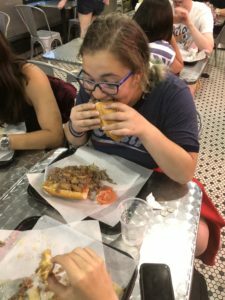 We then drove to New Haven, Connecticut, where we had lunch right near Yale University. Then, we got back on the bus and drove in to Philadelphia. 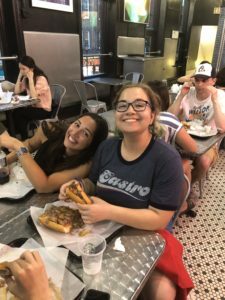 We ate dinner on South Street, including some delicious Philly cheesesteaks, and then went back to the hotel for some chill time and sleep.